HEARTSafe Communities is a program designed to promote survival from sudden out-of-hospital cardiac arrest. It is a general concept focused upon strengthening the “chain of survival” as described by the American Heart Association; it recognizes and stimulates efforts by individual communities to improve their system for preventing sudden cardiac arrest (SCA) from becoming irreversible death. In the basic HEARTSafe model, a region (generally a US state, but county-based and international programs also exist) establishes a set of minimum criteria its communities must meet in order to achieve HEARTSafe status. These should be goals that support the chain of survival, such as widespread CPR instruction, public access defibrillators, and aggressive resuscitation protocols for first responders and area hospitals. 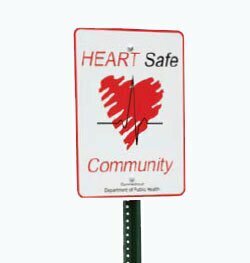 Individual communities in each region which meet the established criteria—such as cities, towns, counties, even neighborhoods or campuses—can apply to their home office and become designated as a HEARTSafe Community. Street signs proclaiming this status are usually posted at the edge of town. If a community does not meet minimum criteria, it can take steps to work toward compliance and eventually earn accreditation. The first HEARTSafe program began in Massachusetts in 2002. Programs now exist in all or parts of Arizona, California, Colorado, Connecticut, Kansas, Kentucky, Maine, Michigan, Minnesota, Nevada, New Hampshire, New York, Pennsylvania, Rhode Island, Vermont, and Virginia, as well as numerous US college campuses; they have also spread internationally to Ireland, New Zealand, and Taiwan, and are under development in Missouri and Tennessee. Typically, programs are managed at the state level through the Department of Public Health or a similar service, and individual communities in each state obtain designation through that central office. Under these various umbrellas, well over 600 local HEARTSafe communities now exist, providing a safety net for over 8,000,000 residents. HEARTSafe is an open-source “collection of good ideas,” and is freely available for any regional agency interested in creating a program. There is no central authority that collects a fee or authorizes its use. It is a grass-roots concept that is spread by word-of-mouth, and support is primarily through peers. This site is designed to provide general information on HEARTSafe, answer common questions, list existing HEARTSafe Communities, and offer advice for developing new programs.